Become an official Tirendo.co.uk partner! Become an affiliate partner of Tirendo and earn money with us! You operate a website about cars, tires or traffic? You want to earn money with your website? 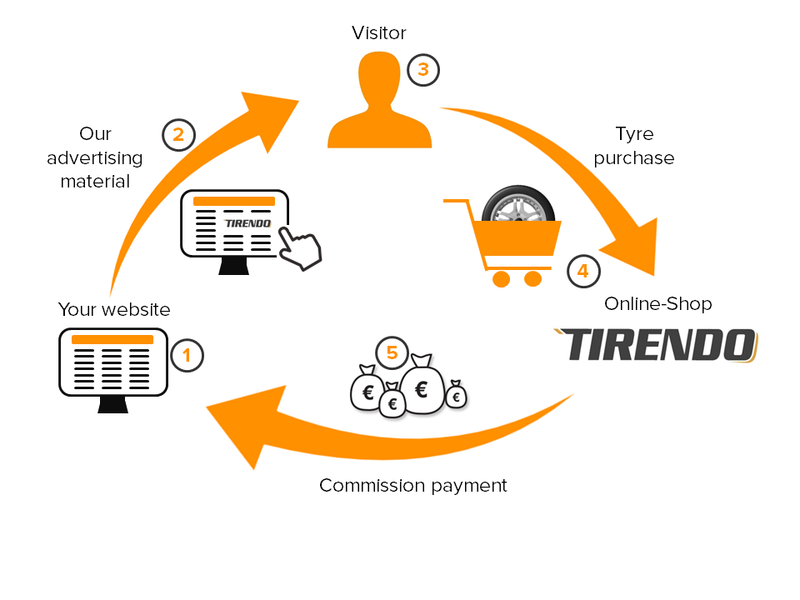 As an affiliate partner of Tirendo it's very easy! Sign up for our affiliate program without obligation - the registration and participation are free of charge! You can participate easily through the affiliate network Affilinet. Now there are only a few steps left until you receive the first commission payment. The registration of your website at Affilinet is uncomplicated and fast. Are you already registered with Affilinet? Then you can become an affiliate partner of Tirendo with just a few clicks. Choose from our graphic banners, search boxes and text links and find the advertising medium that suits you and your site. When clicking on the ad, visitors will be forwarded to the Tirendo shop. When one of your visitors sees our advertising material and clicks on it, he will be automatically forwarded to Tirendo. If the forwarded customer does purchase at Tirendo, you will receive a percentage of the order value as commission. We offer an attractive commission of at least 3% of the net order value (excl. VAT and shipping). For example, if a customer buys a new set of tires with rims, the transaction value may well be at 600 £. For this transaction you will receive a percentage. The more orders you generate through your website, the higher your commission will be.